I love playing May Arts challenges. Not only do you get up to 16! yards of ribbon (4 yards of 4 types) to make your project, you can win THREE spools for first place and there are 10 winners of 1 spool too! I used a variety of ribbon techniques to make the flowers and leaf you see here. 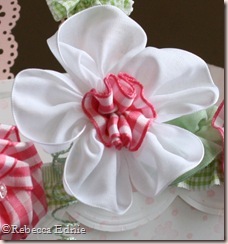 The white flower is made from the new May Arts Linen ribbon, it is a joy to use, soft and semi sheer but stands up to handling. It is ruched; the bottom edge is sewn with a running stitch, every couple of inches (I think 3.5”), you sew up to the other edge with long stitches and back down. When gathered, the long stitches pull tight and create the petals. It does leave a gap in the middle though so in the center of the white flower is a simple gathered flower with the gathering thread run down the center. The ribbon is gathered then folded in half. I wanted it to stand up more than it was so I ran some more stitches around the flower just above the original thread which pulled it into more of a cone. The flower to the left is a traditional rolled rose. There are tons of directions out there right now for these, often made from crepe paper. I’m pretty sure Melissa Frances had one on her blog a week or two ago. 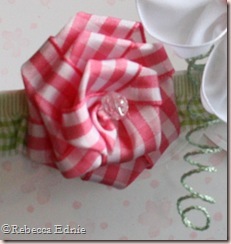 You can also fold wide ribbon in half to make a smaller rose. The center came undone a bit, as a result, wasn’t perfect so I added a crystal to the center. The tendril is wired string I curled around a small pencil. The flower to the right of center is another gathered flower, but this time I ran my running stitch about 1/3 of the way across the ribbon. 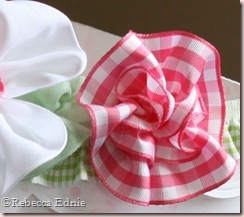 This gives you a double ruffle look without making two flowers! 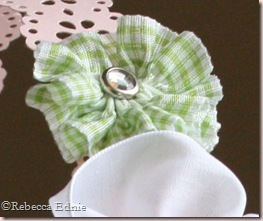 how to make the leaf (light green, hiding between the white and pink flowers) is kinda tricky to describe. Start with a piece of ribbon about 1 1/2 times the length of the finished leaf and slightly wider than the finished leaf. Fold it in half and then fold the bottom (folded) corners up to the finished edge on a diagonal. You will have what looks like a small boat. Sew a running stitch along what would be the bow of the boat from corner to corner. Pull the thread until you have the length of leaf you want and trim the excess ribbon away. I trim mine in a way that I can glue the raw ends to the back. This technique can also be used to create pointy petals. 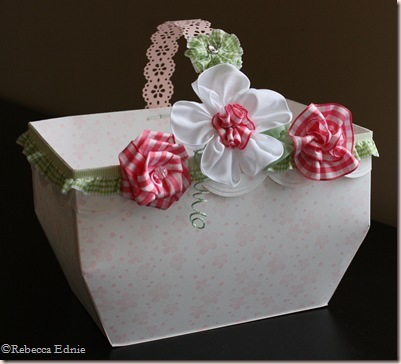 If you visit the Offray site, they have another way to make this with narrower ribbon and pictures. I can draw diagrams of my version for anyone who wants them; just email me! The top green flower is also simply gathered but because the ribbon is already pleated, it doesn’t require much gathering. To hide the middle, I used a rhinestone brad which also attached it to the handle. The basket is an enlarged version of PTI’s Pack a Picnic template. I can’t post pictures of their template online so email me if you want details of how I enlarged it. The top edge is punched with the embossed scallop punch from EK Success. The handle is punched with a double edged MS punch. how u make the flower?? It's so nice.